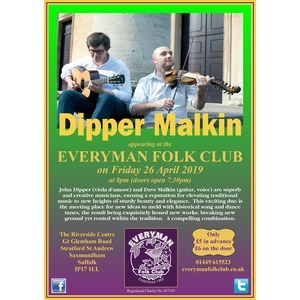 The Everyman Folk Club was re-launched in 1996. It is a registered charity which aims to promote traditional and modern folk music in Suffolk, England. Our Registered Charity Number is 267165. The Everyman meets on the last Friday of each month during January to May and September to November. Doors open at 7.30pm and all events start at 8.00pm prompt. With Residents, Floor Singers and a Booked Guest Artist on every occasion, there is always a warm welcome for new performers and audience members.